At some point BigE had gotten interested in parachutes. Not sure where. 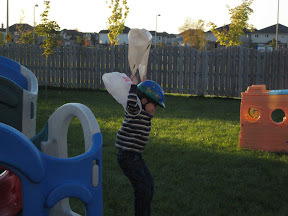 But the other day he was interested in using a grocery bag as a parachute. A classic moment in childhood*. BigE figured that one grocery bag would do. 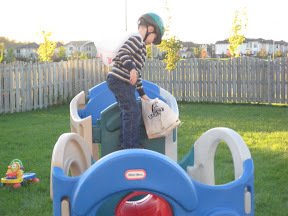 Off he went to jump off the small play structure. It didn't quite work as he'd hoped. But it did look cute. I then went to explain how one bag wasn't going to do the trick. He was confident that the bag was the same size as him and that would do it. I explained how much bigger a parachute is than the person using it. 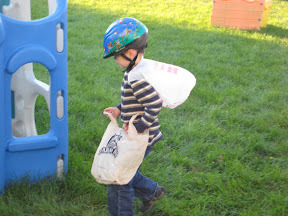 Like all good thinkers, his response was "I'll use two bags"
Note the safety with the bike helmet! So sadly it didn't work. Or atleast not as well as BigE had hoped. But I didn't really want to push things and encourage him to make a bigger parachute. Posted by PB at 11:00 a.m.